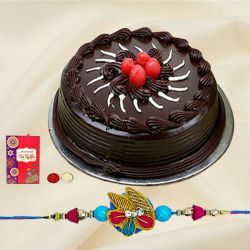 Enthrall your favourite people on Raksha Bandhan with this gift of Tasty Cake in Happy Raksha Bandhan Day teamed with a free Rakhi, Roli Tilak and Chawal to add an auspicious touch to the day. This delightful Hamper consists of a 500 gm. yummy Cake with a fancy Rakhi.